"In the Bhagavad-gita, Eighth Chapter, twentieth verse, it is stated that there is another, eternal nature, the spiritual sky, which is transcendental to this manifested and nonmanifested matter. The manifested world can be seen in the form of many stars and planetary systems, such as the sun, moon, etc., but beyond this there is a nonmanifested portion which is not approachable to anyone in this body. And beyond that nonmanifested matter there is the spiritual kingdom. That kingdom is described in the Bhagavad-gita as supreme and eternal. It is never annihilated. This material nature is subjected to repeated creation and annihilation. But that part, the spiritual nature, remains as it is, eternally." 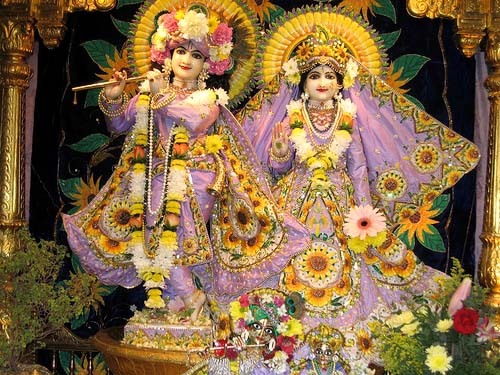 *Click here to see more Deity photos from the Bhaktivedanta Manor.